Human Resource Management (HRM) is the term used to describe formal systems devised for the management of people within an organization. It is a function in the organizations designed to maximize employee performance in service of an employer's strategic objectives. 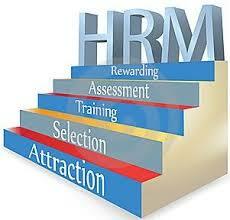 HR is primarily concerned with the management of people within organizations, focusing on policies and on systems. Essentially, the purpose of HRM is to maximize the productivity of an organization by optimizing the effectiveness of its employees. This mandate is unlikely to change in any fundamental way, despite the ever-increasing pace of change in the business world. HR departments and units in organizations typically undertake a number of activities, including employee benefits design, employee recruitment, training and development, performance appraisal, and rewarding (e.g., managing pay and benefit systems). HR also concerns itself with organizational change and industrial relations, that is, the balancing of organizational practices with requirements arising from collective bargaining and from governmental laws. informative post! I really like and appreciate your work, thank you for sharing such a useful facts and information about services of individuals strategies, keep updating the blog, hear i prefer some more information about jobs for your career hr jobs in hyderabad .